The M2000 is a versatile pedestrian controlled pedestrian harvester popular for use in both standard and bush orchards. It picks up and cleans apples and pears easily in short or long grass. It is able to work in most conditions and terrains. 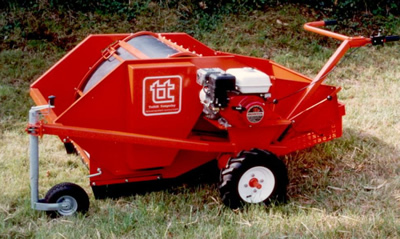 The machine has a Tuthill hedgehog belt for cleaning the fruit. The result is excellent fruit quality in all conditions. The machine picks up over a width of 800 mm (32”) and has an output of over 1 tonne per hour. It is powered by a 5.5hp Honda 4 stroke air-cooled petrol engine. It is economical, quiet, reliable, and easy to start. The harvester has a six-speed gearbox. It provides a wide range of speeds as well as a reverse gear and handbrake. The machine has an adjustable jockey wheel which allows fruit of different sizes to be collected. An oil bath centrifugal clutch on the engine starts and stops the harvester when the accelerator is opened. There are two handlebar positions, one straight behind the pick up and one offset for use under trees with low hanging branches. The cleaned fruit is delivered into two sturdy plastic baskets which each hold 20kgs of fruit. The M2000 has just two vee belt drives and one chain drive. The machine is easy to maintain and very reliable. These machines are sold and serviced throughout Europe.